April 28, 2016 - No Comments! "Eye in the Sky" won't reach that level, but it tops a slew of recent high-end post-Oscar season releases. (Sony Pictures Classics launched "Lady in the Van" in January hoping for Maggie Smith recognition, but even without it still managed nearly $10 million.) Going early in the year can lessen chances of awards attention later, but films can also grab more attention, as audiences do pay heed to new titles over 12 months, not just during the awards-friendly September-February period. And for distributors, competition and marketing expenses are much reduced. And so Bleecker has pushed "Eye in the Sky" to $15 million in just under seven weeks, placing ninth or tenth at the box office for the last four weekends. 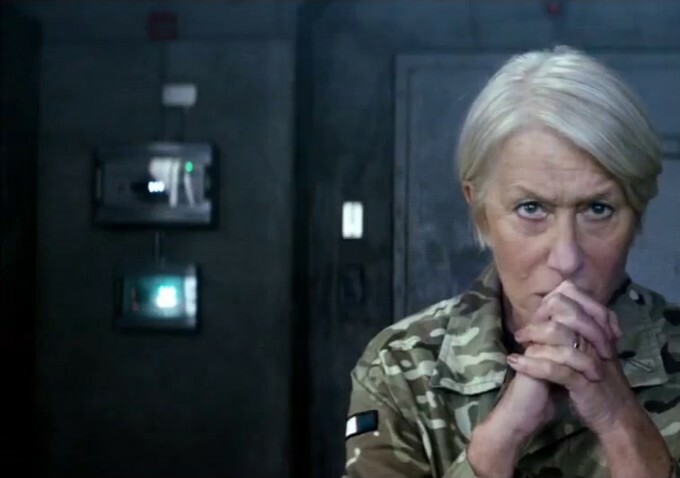 Assuming Hood's drone and missile anti-terror thriller continues to hold well (this past weekend saw only a 22% drop), "Eye in the Sky" looks on track to approach $20 million, a superb result for a film acquired for a reported $2 million when it premiered at Toronto last September. That number would put it in the range of the similarly intense and thoughtful Oscar-winning war saga "The Hurt Locker," which took in $17 million (about $19 million in today's ticket prices) for a summertime release that was not boosted theatrically by its later awards success (it went to DVD). Few actors really can do much more than get a film initial attention, even in the specialized world. Mirren is one of several British actors (also Maggie Smith and Judi Dench) and of course Meryl Streep who immediately lend status to a title. In the decade since her Oscar win for "The Queen," Mirren has played a series of smart, tough-minded and versatile characters with an energy that belies her age and in some cases gender: "Red," "The Debt," "The Hundred-Foot Journey," "The Woman in Gold," "Hitchcock," and "Trumbo." Not all were successes ("Hitchcock" disappointed), but they made her ideal for the role of the woman in charge of a British military intelligence unit targeting Somali terrorists planning new attacks in Kenya. Other than "Lady in the Van," most of the films for specialized audiences for the first two months of the year were Oscar nominees, playing week after week trying to maximize revenues from nominations. That competition for media attention— and likely exclusion from later awards attention —brings a hunger for fresh films by early March. But there is also risk, as the weeks that follow are crammed with releases with similar aims that can quickly overtake the slightly older fare. The March 11 date for "Eye" came about two weeks after the Oscars. The initial week saw Terrence Malick's star-driven "Knight of Cups" in play in New York and Los Angeles, which came and went with little impact. The next week saw "Eye" head to head with Roadside Attractions' older female appeal rom-com "Hello, My Name Is Doris." Both opened well ($23,000 and $21,000 per theater averages respectively). "Doris" smartly broadened more quickly (Roadside often initially takes their films to a wider audience with great success) and outpaced "Eye" at first. But Bleecker Street held back until April 1 to really broaden, going from 123 to 1,029 runs to make its biggest advertising push. It came with a bonus. That weekend saw no new wide release films from studios (a rarity), giving it a higher profile and easy access to top theaters across the country. Few specialized films break out without shaping marketing to both capitalize on strengths (Mirren's presence and good reviews) and overcoming weaknesses. The latter kept "Eye" from getting an even higher acquisition price for its producers. Its military subject sometimes works for the specialty audience, but rare success "The Hurt Locker" was aided by the best possible critical response and fell much earlier in the cycle of post-9/11 war films. Obviously "American Sniper" was in another league entirely. Its specific subject—a complex series of decisions about targeting terrorists and the technological and human elements involved—had previously been covered in "Good Kill" with Ethan Hawke last year (just after "Boyhood"), who played a nearly identical role to Aaron Paul's missile-targeter questioning his job. It managed to gross a grand total of $316,000. What sets "Eye" apart is that though the moral dilemmas involved are front and center, it is shaped more as a thriller and skillfully weaves several different perspectives and locations (mainly Nairobi Kenya, London and a Nevada military base) together over a brief period as a group of likely terrorists are spotted together (by aerial spying equipment). The human drama involved —the stakes and dilemmas for the various military and civilian participants, the issue of collateral damage on the ground, all against a tight and increasingly suspense-filled deadline —is multi-faceted. But it is tough to convey this in a way to give it a distinctive feel, let alone engage an older audience used to more conventional dramas and themes. The marketing material— trailers, posters, clips — tackled this head on. They emphasized the film's complex moral issues (even more relevant in the middle of a presidential campaign with issues of appropriate military response are central), the gadgetry involved (real life, not fantasy, but giving the film a James Bond feel) and positioned the film as a thoughtful but tense thriller. This isn't hard to pull off in a trailer, but finally the people who were compelled to see the movie came away satisfied. That's when good word of mouth feeds a hit. The marketers also made sure this wasn't presented as only a star vehicle positioned to garner awards notice. While Mirren surely delivers, the film's strength is its ensemble led by Alan Rickman in one of his most riveting (and sadly final) performances, as well as Paul showcasing his talents better than any other post-"Breaking Bad" role. But the casting gave dividends beyond: Oscar nominee Barkhad Abdi proved that "Captain Phillips" wasn't a fluke, as well as a whole range of skillful British actors including Phoebe Fox, Jeremy Northam, and Iain Glen. And this extended to the smallest roles where stock characters quickly gained depth and usually sympathy for their characters' plights and dilemmas. With the right Bleecker awards positioning later in the year, Mirren, Paul and Rickman (the latter oddly never Oscar nominated) could score some nods. For better or worse, the formula for breakout success for specialized films these days is narrow. Apart from the near prerequisite English soundtrack, too many movies, despite the pretense of cutting edge arthouse films, often play it safe and conventional without challenging audiences. In truth, the older specialized film devote, though often politically liberal, tends to be more artistically conservative, often responding to feel-good movies. "Spotlight" is an example of a superior drama with great craft that deserves its acclaim. Most successful films mute their moral dilemmas to make audience identification relatively easy (though some popular films like military-themed "American Sniper" and "Zero Dark Thirty" absorb some complicated issues). "Eye in the Sky" puts morality front in center for its audience, giving them all the sides but leaving it to them to answer for themselves what the right decision is. That is a risk that seems to have been pulled off here. The film does more than rely on a straightforward narrative story and outstanding actors. The script is wordy and dense, but the film's masterful editing adds tension as it cross-cuts among diverse visually exotic locations over a limited (and crucial) time frame and deploys sound and VFX to good effect. The slower release pattern seems to have worked to increase interest from men who are not normally specialized film attendees. Bleecker worked hard to draw from military communities (the film did particularly well in the Washington D.C. area). This audience isn't easy to reach, but once they sample and like it, this can increase appeal and sustain word of mouth interest now evident in later weeks of the run. Unusually, "Eye" manages to bring tension, excitement, and edge-of-seat intrigue to a specialized movie. Clearly this paid dividends. Sometimes external events come into play during a film's life. The unfortunately untimely death of Alan Rickman came just ahead of the release and gave greater attention to his work. Ongoing news focus on drone attacks also added interest. But luck within the release schedule can help as well. The last few weeks have seen an unusually big number of early spring high-profile specialized releases. Apart from the successful "Doris" and the Terence Malick flop, new releases have included prime entries from Jeff Nichols ("Midnight Special") and Richard Linklater ("Everybody Wants Some!!") that both proved to be disappointments, and more niche-appeal films like "Miles Ahead" and younger-oriented "Green Room." Bleecker Street benefited from a lack of competition, so more of its potential audience gravitated to the movie, adding to its gross. Things came together here. Skill in the making of the film (and its depiction of smart people at work as a team, sometimes in conflict, not unlike "Spotlight") and in its release led to mission accomplished.